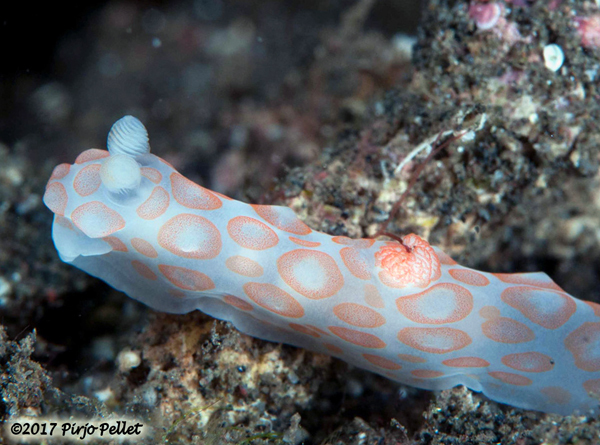 Opisthobranch of the Week is Gymnodoris sp. At first glance this nudibranch looks very similar to Gymnodoris impudica (Rüppell & Leuckart, 1830) and G. rubropapulosa (Bergh, 1905). However there are distributional differences and external morphological differences and possibly internal & DNA ones. G. impudica was described from the Red Sea & far Western Indian Ocean and is thought not to occur further east. Gymnodoris rubropapulosa generally has larger orange dorsal pustules while G. sp. 18 has lower pustules surrounded by a broad pale orange speckled ring. G. rubropapulosa has orange rhinophore clubs while the bulbous rhinophores of G. sp. 18 are translucent white with a very light dusting of pale orange along the anterior. Gymnodoris sp. 18 also lacks the orange border to the foot present in G. rubropapulosa and has a smaller gill which is dusted in pale orange. G. sp. 18 appears to be a smaller species with records of 15-25 mm to date. In private communication with Gymnodoris specialist, Vanessa Knutson, she indicated that this specimen has been sequenced but as yet she has not been able to analyse the data, so it may or may not be a juvenile G. rubropapulosa or a distinct species. We will all just have to wait and see! This intriguing specimen was photographed while diving with a small team of enthusiasts enjoying a week's trip on the Wunderpus, a small live-aboard which operates out of Labuanbajo, Flores. For this trip For this trip co-owner Chris Edison was persuaded to spend most of the time around the actively volcanic island of Sangeang but also in Bima Bay, Sumbawa and then Komodo National Park. Photo at immediate left taken by Pirjo Pellet. (Mr Slug Site), co-owner Chris Edison, Bree Zabriski, Jim Anderson & Yan Alfian. As regulars to the Slug Site will already know from seeing her previous contributions, Lindsay's fascination with all things aquatic began as a small child and this has carried on throughout her life. However, it was only when at university that she discovered that diving was not just the prerogative of the elite. Beginning in 1974 with her first OW dive in 1975 near Marseilles, France, she noted in her logbook finding a nudibranch but had no idea what it was at the time. However many years later she was happily able to identify it. On the photographic front, the only reason she ever took it up was purely to document what she saw when diving. She started with a second-hand Nikonos II, then a Nikonos III and later progressed to a Nikon F3 in an Aquatica housing. However, she became an accomplished photographer of land & air wildlife as well as human life events, capturing special moments. And yet still her first love remains with molluscs. Having dived in many areas of the world including the UK, the Mediterranean, (Spain, France, Corsica), Red Sea (Israel & Egypt), Bahamas, USA (Florida, California, Hawaii), St Lucia, Montserrat, South Africa, Madagascar, Brazil, Fiji, Tonga, French Polynesia, the Tukang Besi Archipelago (SE Sulawesi, Indonesia), Lindsay now spends most of her time in Indonesia diving in places such as Bali, Alor, Lembeh as well as Sangeang, Komodo, Flores, Sumbawa, but also in the species rich Philippines. As some of you probably already know, Lindsay spent several seasons in the mid 1990s to 2000 in the Wakatobi National Park islands (Tukang Besi Archipelago, SE Sulawesi, Indonesia) with Operation Wallacea. I am sure it is there that she perfected her technique of non-invasive underwater photography, something I will never master. Lindsay is able to photograph with a 105 mm lens and Macromate wet diopter while hovering about the subject without actually settling down on the seascape. Once more, she is able to do this with macro and super macro subjects. The results are amazing as the reader can see. 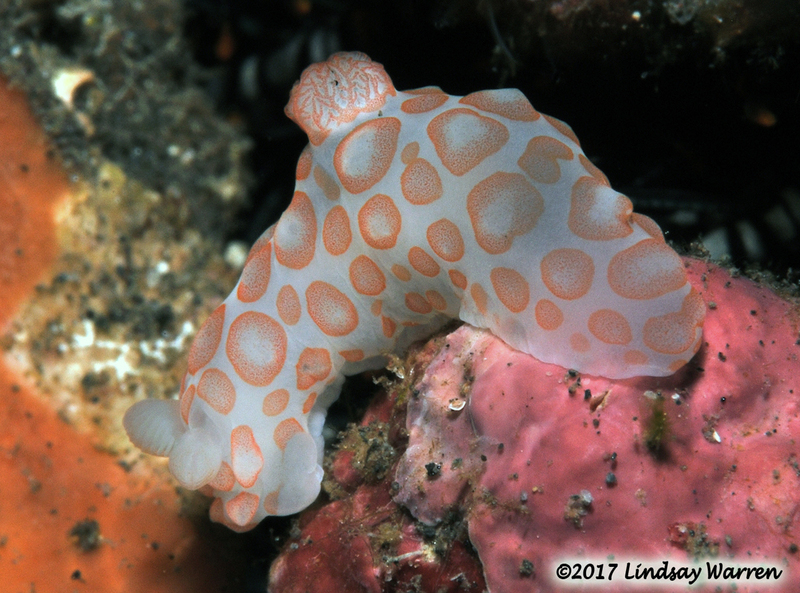 Lindsay was a prolific contributor to Bill Rudman's Sea Slug Forum when it was still an active site but she continues to look for and photograph opisthobranchs of all kinds sharing her finds with us via facebook, contributions to ebooks and id apps as well as direct with taxonomists around the world.